The meterhead of the PD340 Flow Transmitter consists of a metering pipe and two magnetic coils. 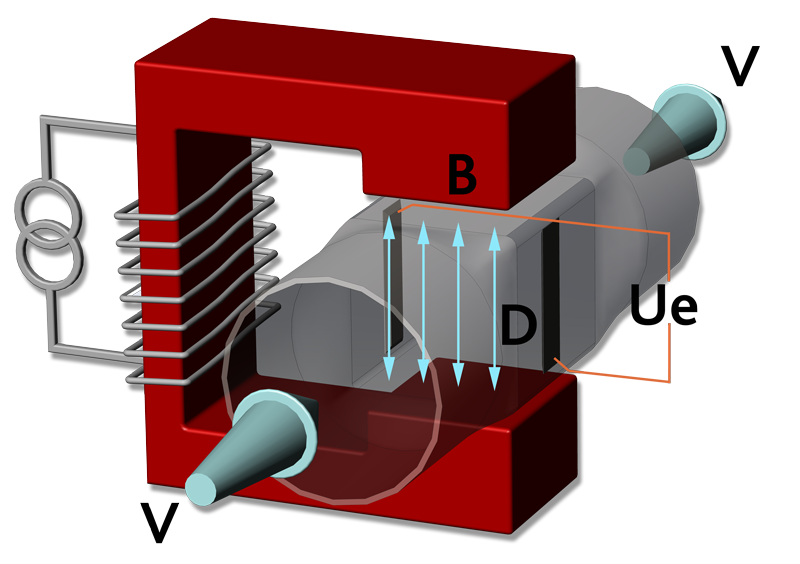 When a current is applied to the coils a magnetic field is produced at right angles to the metering pipe. The PD340 Flow Transmitter utilizes a square measurement chamber. The shape of the measurement chamber significantly reduces the influence of viscosity, type of liquid, and flow profiles. Practical tests with the PD340 confirm that it is not necessary to recalibrate the meter when changing product, for instance from water to milk. This would normally be necessary when using mag meters with traditional round measuring chambers. The microprocessor in the transmitter controls the current generator keeping the magnetic field constant. The voltage across the electrodes is amplified and converted to a digital value from which the micro-processor calculates the liquid flow.